The GaelPantry grew out of students' concerns for other students as members of the SMC community. It also was created from a larger general reality: food insecurity can hit anyone at any time throughout any phase of life. The GaelPantry is a tangible way that SMC and the MMC is providing better systems of food security on campus. For additional resources, please see SMC's Nutritional Support page. Who is eligible to use the GaelPantry? Any Saint Mary’s College student with a valid student ID number. Do I need to prove need? No. We do not ask for any kind of income verification at this time. Instead, we ask for students who are in a position of food insecurity to assess their own need. 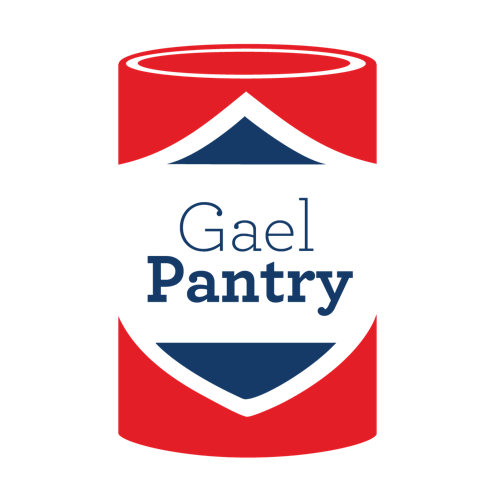 The goal of the GaelPantry is to serve students who are in need; not be a convenient alternative to Safeway. When is the GaelPantry open? Where is the GaelPantry located? 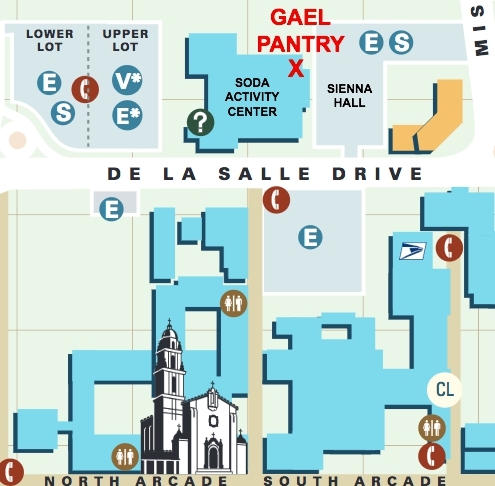 The GaelPantry is located in the parking lot between the Soda Center and Siena Hall. There will be signs nearby the Soda Center to give additional guidance during open hours. How often can I get food from the GaelPantry? Each student has 8 points per week. The student may choose to use all 8 points in one visit, or come back multiple times in a week during open hours. Further instructions will be offered to those who visit. What should I expect when I come to the GaelPantry? 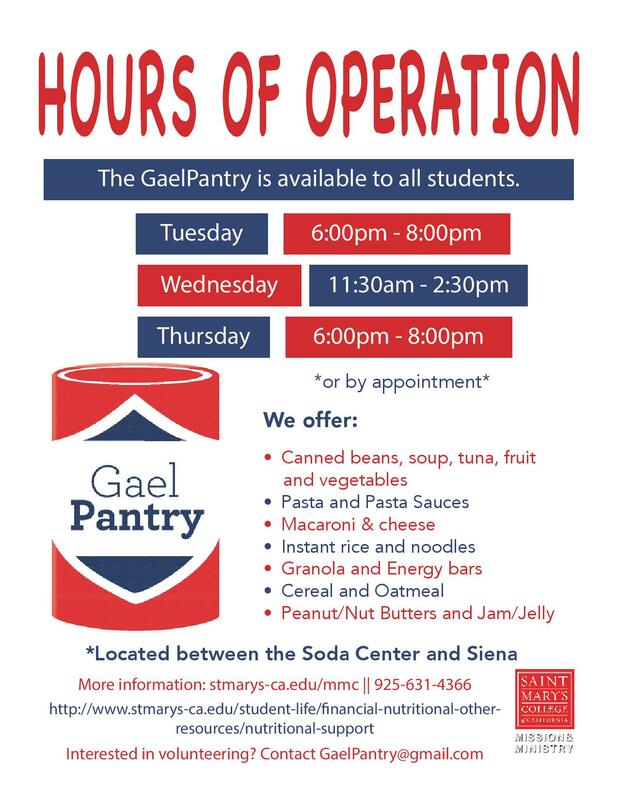 Simply stop by the GaelPantry any time during open hours with your student ID card. A student volunteer will ask you to input your ID number in our online system. If possible, please bring your own bag to cut down on waste. Each food item will be labeled with different “point” values depending on amount of food and longevity of food. As previously mentioned, each student has 8 points per week to spend at their discretion. You can mix and match food items as you please! After you have selected your food items, a student volunteer will ask you to “check out” your items on a confidential Google form which allows SMC to keep inventory of what foods need to be restocked. What do we do with student information? Your name will not be disclosed; only your Student ID. Our student volunteers have been trained to keep confidentiality and provide a welcoming environment. Our system is designed with a threefold purpose: to ensure we have enough food items to meet demand and to provide the necessary data for best practices in the future. 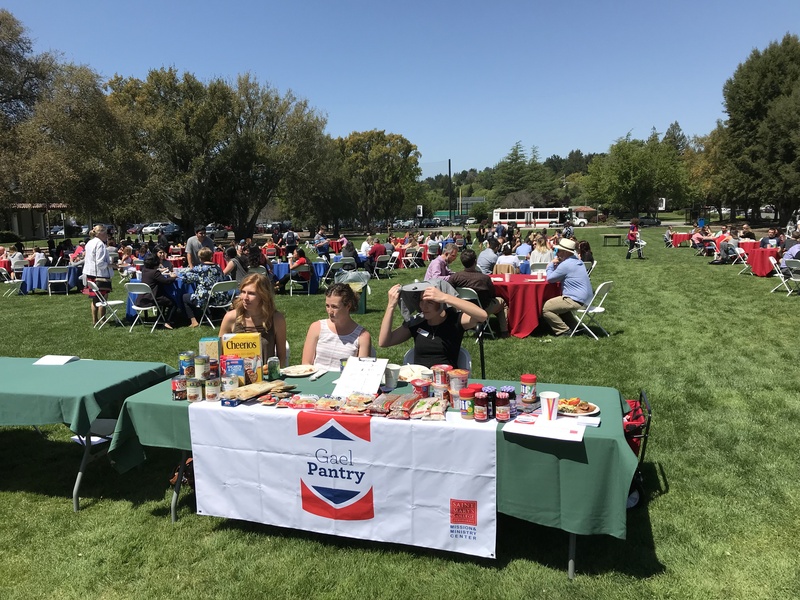 Why did SMC start an on-campus food pantry? 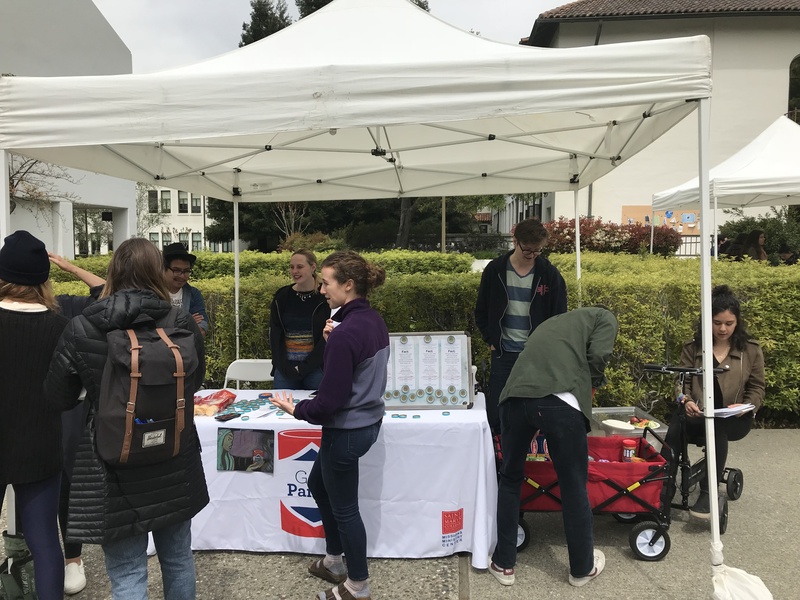 Food insecurity is a growing concern among college students across the nation; reports show that between 20% and 60% of college students on a college or university campus experience food insecurity. Food insecurity is defined as “the state of being without reliable access to a sufficient quantity of affordable, nutritious food.” Although Saint Mary’s may be located in an affluent area, its students are by no means exempt from the challenges of food insecurity. In light of the growing cost of higher education, food is often the first thing to be cut from a college student’s budget with the growing cost of higher education. 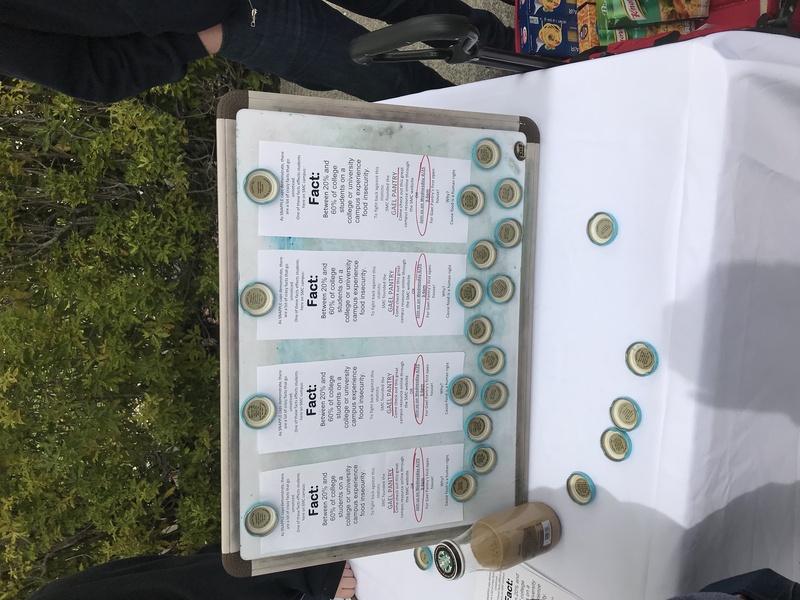 After students on the SMC campus made a point to reveal the level of need that occurs on this campus, it became clear that action needed to be taken in order to support and care for our students. Since our Lasallian Mission has concern for the poor and social justice as a core principle, the installment of a physical support to students aligns with the larger mission of SMC. What is the history of the GaelPantry? In March of 2014, SMC students took it upon themselves to reveal struggles they were experiencing in an event called Economic Realities. 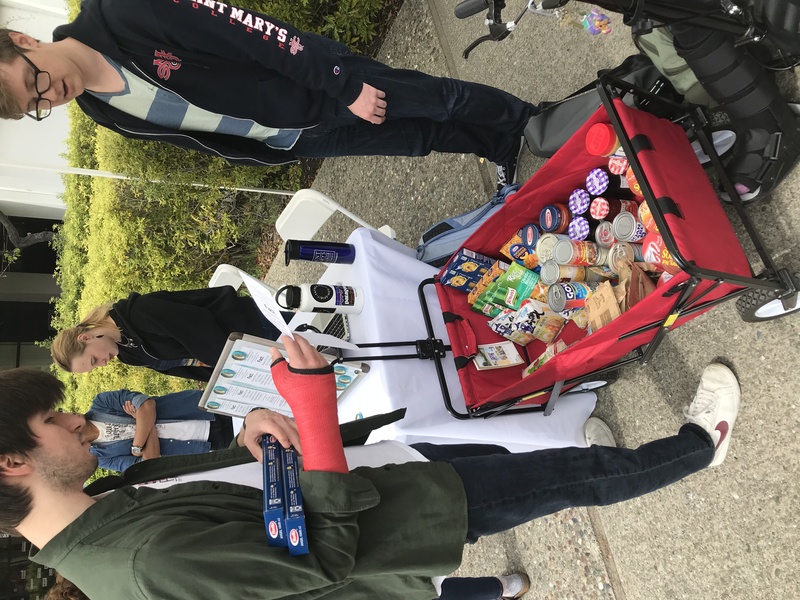 When students took the opportunity to voice their concerns to staff and administration, for themselves and for fellow students, it became evident that students needed tangible resources--particularly nutritional assistance. Plans to install an on-campus food pantry began to take effect in MAY 2014-2015 but got steam when MMC partnered with the Christian Brothers and invested students in January 2016. 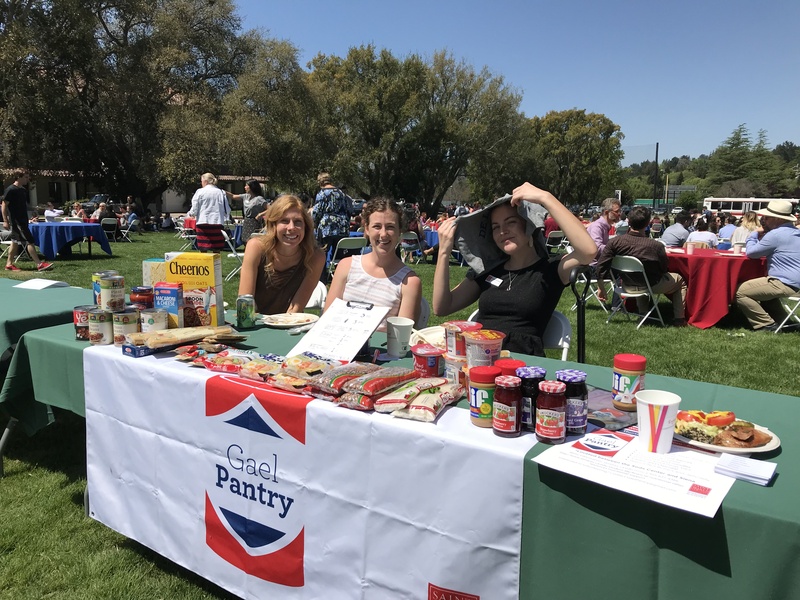 The GaelPantry Committee was formed by the Mission and Ministry Center, student leaders, and Christian Brothers in March. The GaelPantry Committee produced a GaelPantry Proposal that was shared with the Cabinet. 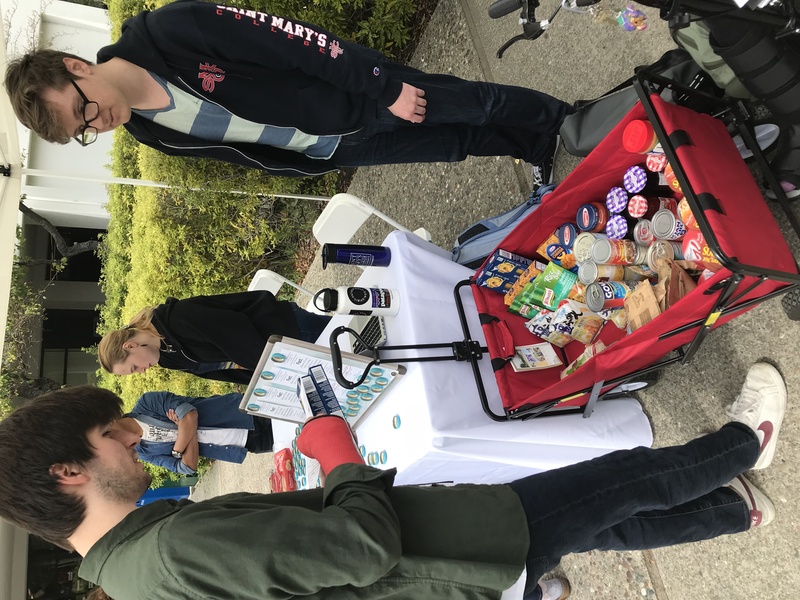 In May 2016, a student group called “End the Silence” requested an on-campus food pantry in their list of demands as a tangible support for students, again demonstrating the urgency for this resource. The President and Cabinet accepted the proposal with the understanding that the Mission and Ministry Center (MMC) will coordinate its operation (reporting to the VP for Mission) for a one year pilot program. The CFO recommended that the Director of MMC work with Sodexo to secure support and an appropriate space. The pantry is planning on opening October 12, 2016. Contact gaelpantry@gmail.com to get access to the volunteer sign-up sheet and additional training. The food donations listed below will be accepted in donation bins around campus--particularly the Mission and Ministry Center any time during regular business hours (Monday through Friday 9am - 4:30pm) or can be taken directly the GaelPantry during its open hours. Financial donations to the Gael Pantry in the form of checks can be sent/made out to the Joseph Alemany Community of Christian Brothers (P.O. Box 4990/Moraga, CA 94575). When the Community receives the check it will be deposited into and coded to our “Donations” line. The Community will then write a check to Saint Mary’s College directed to the Gael Pantry. The Community will also send the donor a formal thank-you letter, noting that we are a 501(c)(3) and that the donor can make the appropriate tax deduction. What types of food are available at the GaelPantry? The Gael Pantry is currently only offering non-perishable food items. This point system will be re-evaluated with usage and need to make sure that the Pantry is being as helpful as possible to those in need.